Gold prices rose to a two-week high on Friday with traders creating fresh positions amid optimism about US-China trade talks after a Chinese official said that the talks have reached consensus in principle with the US on the main topics. Moreover, a growing sentiment that the Fed will not be in a position to hike in 2019 as futures markets were assigning a 10% chance to a December cut, leading for the DXY to drop and for Gold to shine. Gold prices gained traction and climbed above the $1320 resistance level as expected to print fresh highs at $1322.56 per ounce. 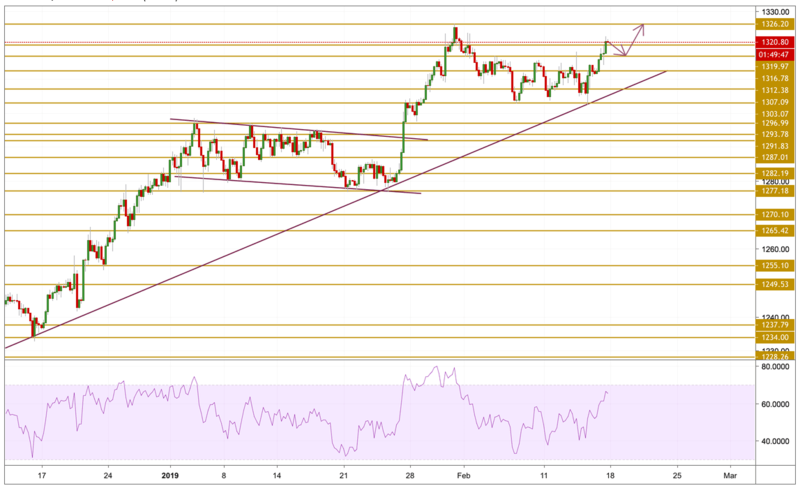 The price is currently resting above the $1320.5 level with a very bullish momentum who is yet to warn us from overbought conditions as we can see on the RSI's chart. We expect the upward move to continue as we will be focusing on the $1326.2 resistance level.